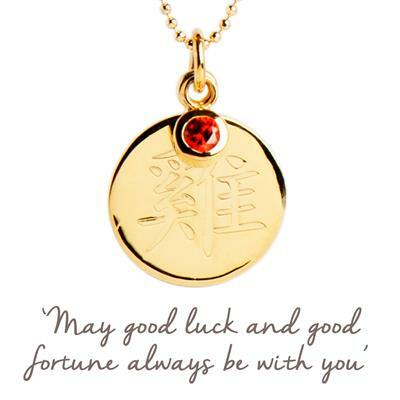 If you were born in the year of the Rooster (1933, 1945, 1957, 1969, 1981, 1993, 2005, 2017) then 2017 is traditionally thought to be unlucky, those born in this year are gifted good luck charms throughout their zodiac year in China, to bid them good luck and keep negativity at bay. Wear your Rooster necklace to keep you calm, safe and content this year. Roosters are notoriously punctual (the Rooster is natures alarm clock) loyal, beautiful, hard-working, courageous, independent, funny and honest. They like a neat and organised living and working space and whilst known for the punctuality and perfectionism are paradoxically wild and free spirited. Made from 925 Sterling Silver with 18k Gold plating, engraved with the traditional Chinese symbol of the Rooster and featuring a hanging CZ in China's lucky colour, Red.